Performers include: Rachel Nichols, Victor Webster, Erik Knudsen, Stephen Lobo, Roger Cross, Lexa Doig, Tony Amendola, Omari Newton, Luvia Petersen, Jennifer Spence, and Brian Markinson. In this police drama, Kiera Cameron (Rachel Nichols) is a Protector; a regular cop from Vancouver in the year 2077. Through a series of events, she finds herself trapped in present day — alone and a stranger in a strange land. To make matters worse, there are eight of the most ruthless criminals from the future, known as Liber8, loose in the city. Thankfully, through the use of her CMR (cellular memory recall — a futuristic liquid chip technology implanted in her brain), Kiera can connect with Alec Sadler (Erik Knudsen), a seventeen-year-old tech genius. Using his prototype 2012 wireless technology, Alec is able to help Kiera track the Liber8 agents and provide her with information to help her operate in our time. In order to track the terrorists down and keep them from changing the past (and presumably future), Kiera joins the 2012 Vancouver Police Department. Thanks to Alec’s help, she’s able to do this without the necessary credentials. Kiera knows that the eight terrorists will resort to criminal activity to further their goals of taking down the corporations that will one day rule the world. Partnered up with Detective Carlos Fonnegra (Victor Webster) of the Special Investigations Unit, Kiera positions herself perfectly to hear about Liber8’s activities and to hopefully intervene. Like Kiera, Carlos is also a cop with a passion for justice. They are from totally opposite ends of the ideological spectrum however. Carlos believes in justice for the individual while Kiera’s 2077 sensibility has brought her to believe in justice for corporations. Kiera has been brought up and trained to always depend on her technology. She finds that her relationship with Carlos has her learning to listen to her gut for the first time. First aired: October 16, 2015. What do you think? 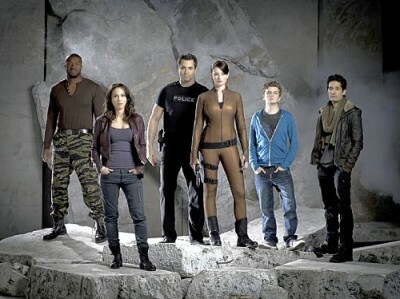 Do you like the Continuum TV series? Do you think it should have ended or been renewed for a fifth season? Can you add more episodes even though it’s been 4 years. This is one of the best shows ever. It should not have ended.